November 26, 2018 - News - Tagged: Games, Local, Yu-Gi-Oh! ROSEMONT, IL — Tensions were high at last night’s Yu-Gi-Oh! Championship Series tournament as over 1300 men and three women competed for a chance to participate in next year’s national championship. But for one poor soul, the excitement of it all was too much. Steven Serge, 29, had entered the tournament with dreams of coming out on top with his invitation for nationals. For most of the day, things were going well. 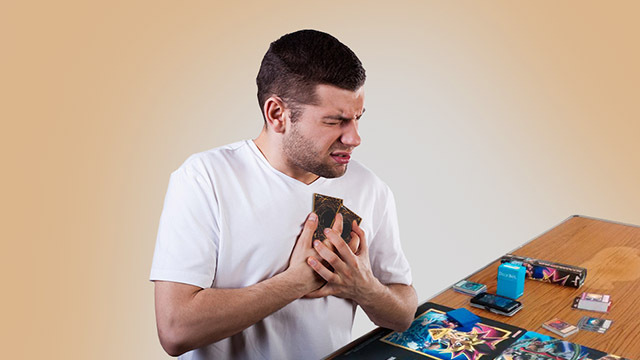 Piloting a deck especially tuned to counter the local meta-game, he had played three solid duels in a row, but upon the beginning of the fourth round he could feel that something was off even before his opponent arrived at their designated table. When his opponent finally did arrive, an aura of darkness wafted over the table. The man, dressed from head to toe in strange clothing, silently put down his deck and mat and motioned for Steven to do the same. Reports indicate that the men dueled for nearly twenty minutes before things came down to a single draw. As Steven set his palm on the top card of his deck, a strange pain came over him. Clutching at his chest, he attempted to draw his last card. The audience cheered as they could see the card before its owner and knew he had everything he needed to win. But it was not to be, as his palmed the card the rest of his body collapsed and he fell upon the table before him with a heavy thud. He had died upon the verge of victory. A hush fell over the audience, it was all over, both the game and a poor soul’s life. Steven ended the tournament with a record of 0 wins and 4 loses, as according to Konami of America’s tournament rules, dying in the middle of a game is an automatic match loss.